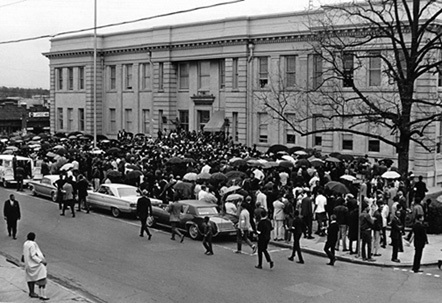 And Justice for All | » Civil Rights Demonstration after the Assassination of Martin Luther King, Jr.
Civil Rights Demonstration after the Assassination of Martin Luther King, Jr.
Dr. Martin Luther King, Jr., was slated to visit Durham April 4, 1968. Feeling his support was still needed at a sanitation workers’ strike, he made the fateful decision to stay an extra day in Memphis, where he was assassinated. The next day several thousand people marched peacefully, ending with a rally on the steps of City Hall, pictured here. The next evening, April 6, arsonists besieged the city, setting 13 fires. National Guardsmen were mobilized to allay the situation, and a 6 a.m. to 7 p.m. curfew was imposed. Despite the precautions, seven more fires were set the next night.